Several years ago, scientists discovered a way to clone dinosaur from viable DNA preserved within the fossil record. After a few mishaps along the way, the process has stabilized. Today it's the museums that have gone practically extinct, as shrewd investors have turned those initial dinosaur sanctuaries into bustling theme parks, true meccas for dino fans the world over. 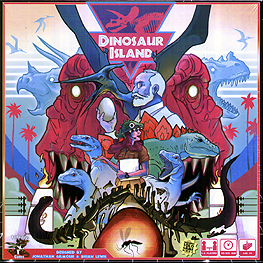 In Dinosaur Island, each player takes on the role of a park manager at one of these premier destinations. You've been handed the reins to a burgeoning operation - bring the fantastic creatures of the Jurassic, Triassic, and Cretaceous periods forward into the modern day. Early retirement is yours if you can make your park bigger and better than the competition.